This photo has been updated Jan 18, 2012. All other pictures were from the original Vancouver trip in 2008. I'm back from my week on the west coast. Can I just say how utterly awesome Vancouver and Victoria are? I was in my glory when we visited Lonsdale Quay Market and Granville Island Market. We don't have "markets" here in my small city in Southern Alberta. I get the pleasure of grocery stores and ONE small Asian store. But seriously....Granville Island Market?! Oh how I love thee. We went on a Saturday and the whole market was buzzing and crowded with people. There was a huge organic produce section, many fresh seafood counters, fresh bread, fresh italian....EVERYTHING! Oh and there were buskers everywhere. It was so exciting. We were sick of eating out and wanted to cook a fabulous meal for my Father-in-Law. I had already decided to make my Roasted Salmon with Sweet 'n' Hot Mustard Glaze. We came to a fresh seafood counter and were utterly excited to see bright red salmon fillets staring up at us. We are used to frozen lumps of pink salmon (still good)...but not like this. This was Wild BC Sockeye Salmon....mmm. *Instead of using dijon and mustard powder, I just bought Heinz Bold and Spicy Mustard and it did the same thing. 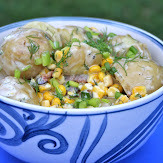 I've made this recipe a ton of times the original way and this tasted basically the same. 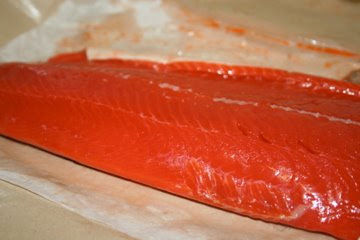 So here is the gorgeous red sockeye salmon fillet we picked up at the market. Use whatever salmon fillet's you can get. If you are like Steve and I, and staying in a guest room with almost nothing, you will need to go to the nearest McDonald's and swipe yourself some packets of salt and pepper. Once your fillet is seasoned up, you can go ahead and make the glaze. Combine your mustard, honey, mustard powder (if you are using it...and I recommend you do if you aren't using a mustard with bite), finely minced garlic and the juice of a lemon. Mix it all up good and then this is when I check to make sure the balance is good. Too lemony? More honey. Too sweet? More mustard. You get the picture. Then pour about half of the glaze on your salmon. Chop up some fresh dill and add it to your reserved sauce. 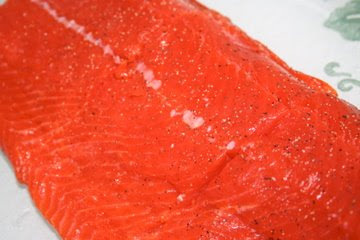 Then throw 'er in the oven and let it roast for about 15 minutes until the salmon is fork tender. I kept this supper simple since I didn't have much, and I served it with a baked potato. Spoon more of that sauce over your salmon and dive in. It's so good, Steve's Dad was spooning sauce over his potato as well. Gotta love those classy dishes the guest room provided us with. Above and by far our favorite way to eat salmon. This is simple enough that I made it in my little guest room kitchen. We were all licking our plates clean after this one. So try it. Seriously. Once I am in my new house and cookin in my new kitchen then I am sooo gonna try this one and I will let you know how it turns out! 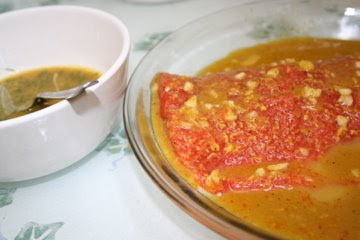 I love fish, my hubby not so much but he will eat anything I make :) I am excited to try this one...!! Good, I hope you like it...though I'm sure you will ;) Let me know how it goes! I loved this recipe. I noticed that your salmon turned out with the tiny white film on it that mine always does. I know it's not a big deal but it's not all that appetizing, especially on more fatty types of salmon. Is there a way to avoid this happening? I've never ordered a piece of salmon from a restaurant and seen it served with the mysterious white film that I always see at home. 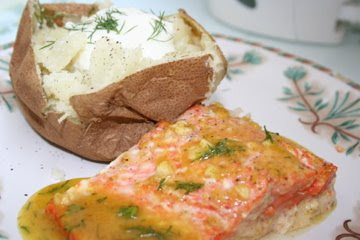 Great salmon recipe! 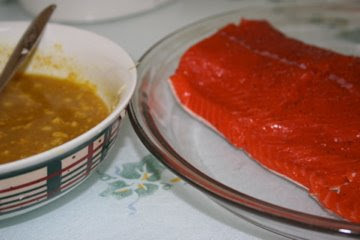 My youngest always picks at cooked salmon when I serve it (he really only likes his salmon raw). I have never seen him eat fish so fast! Our family really enjoys the recipes from you...thank you! This was my first time making fish from scratch (always bought prepackaged, preseasoned frozen fillets)... I don't know what I've been waiting for! It was great, my husband loved it (he doesn't really like fish), and it was quick enough the baby kept herself entertained in her chair - Thank you! !